Today we're doing to focus on two important features that might be very helpful for structuring your livestream. Have you ever gotten off a topic? 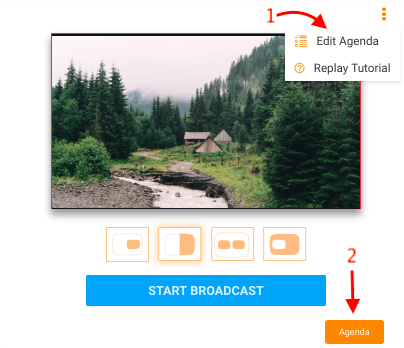 Creating and distributing an agenda that outlines the topics to be discussed on your broadcast will help you stay focused, or get back on track! 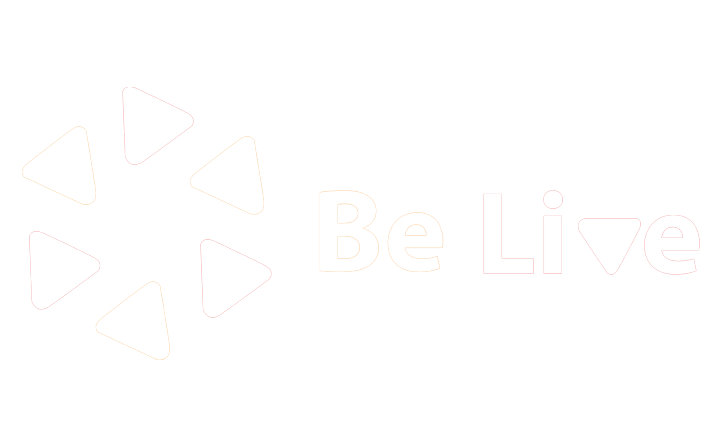 There are two ways to set up your agenda with BeLive. 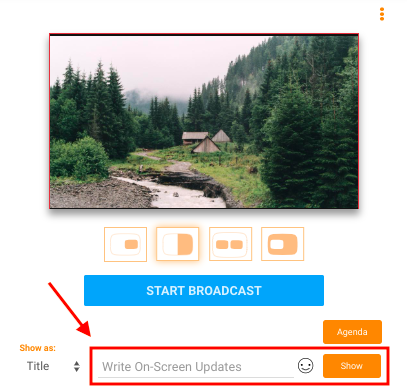 You can do that by clicking on three dots in the top-right corner of the screen or Agenda button beneath "Start Broadcast". Once you pressed one of those buttons, the following window appears where you can add your agenda items. 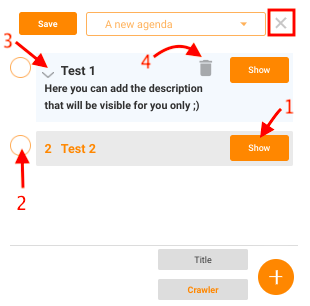 Just click on the orange plus and choose the desired option: Title or Crawler (moving text at the bottom of the screen). 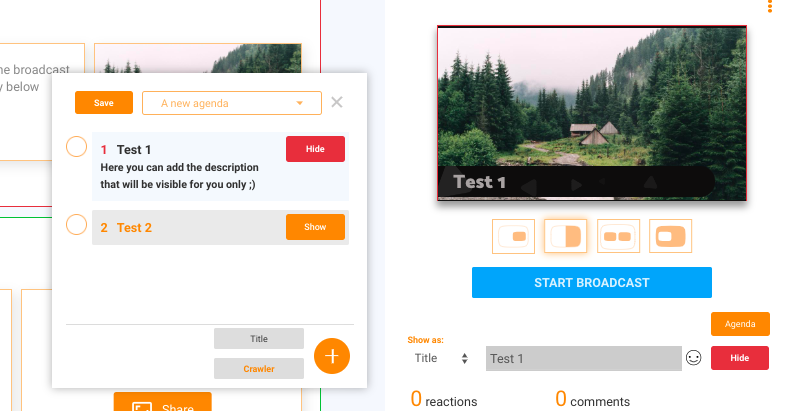 Let's have a closer look at how to create each of the suggested options and how it will look like for your viewers. Please, fill in all the fields and click "Add Title," so that it appears in your agenda list. Note, that description is shown only for you while Title you are able to show on the broadcast. Select Crawler, add the text and press "Add Crawler" once done. Click on "Show" button for text to appear on the screen. If you're done with the topic, mark the agenda item, and it will be automatically moved to the bottom of the list. You can also change the order of your items by using arrows next to the title of an item. To remove the item, just click on the trash icon. Keep in mind, once created an agenda item, you won't be able to edit it. 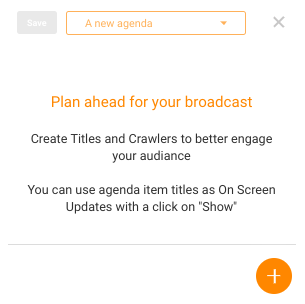 If you select branding while setting up a broadcast, you can customize the background and text color of Agenda and Crawler. (check out our article or tutorial on how to add your branding). 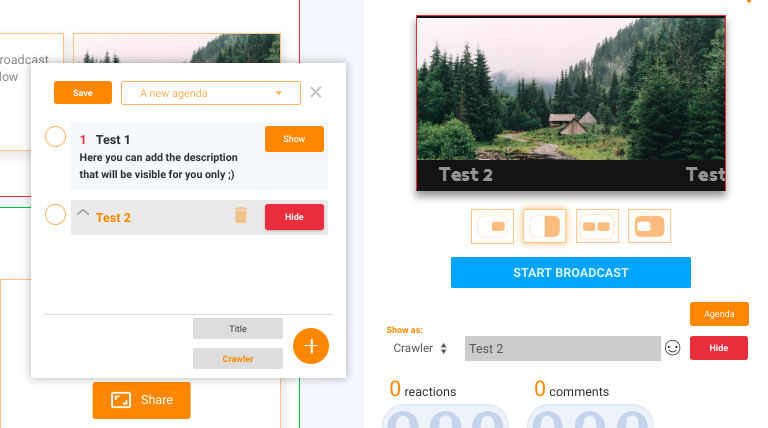 Besides the mentioned above options, you can also show your comments on the screen during the broadcast to engage with your audience. For this purpose, you can use On-Screen Updates that can be found under the preview window. Write the comment you want to share and click on "Show" for text to appear on the screen. In case you want to remove/edit the text, press "Hide" button. You can use Title or Crawler format. Beware that only one comment can be displayed on the screen at a time. Once you added the agenda item, it replaces the current comment. Feel free to contact us via chat if you have any further questions!